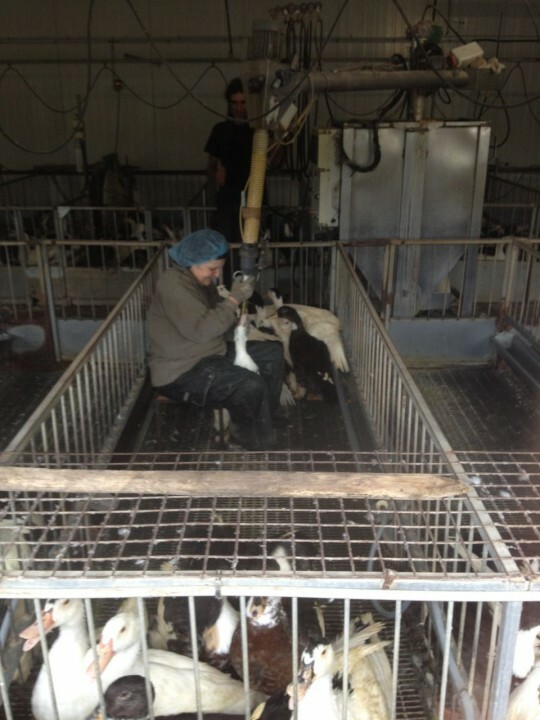 A foie gras farmer feeding her ducks during the brief period of gavage. The ducks at the bottom of the photo showed no signs of illness or discomfort (they were quite merry, actually, if that’s possible). Photo by Michael Ruhlman. Last summer, on assignment for Condé Nast Traveler, I visited a farm that raises ducks for foie gras, driven there along harrowing roads in southwestern France by Kate Hill. I’d never seen the practice, vilified in America, of force-feeding ducks and, being in the land of foie gras and confit de canard, I had to see for myself. 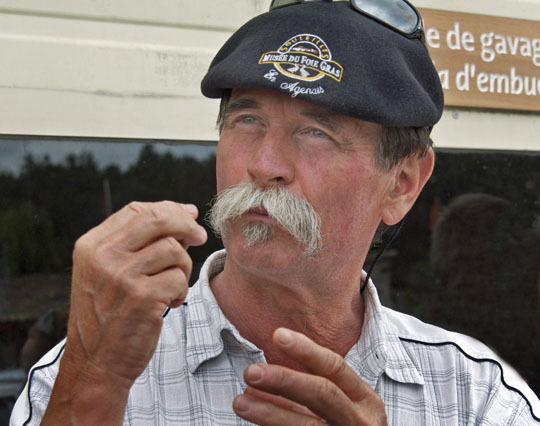 The farm, Souleilles, run by Yves and Geneviève Boissière, is wide, wide open in the town of Frespech. The husband and wife were warm and welcoming and watched me take an iMovie and iPhone pix of the practice while Yves spoke at length about the process. The ducks are pasture raised most of their lives, then force fed for 14 days, beginning with a little less than half a pound twice a day, increasing to less than a pound (400 grams) at the end. Granted, it’s a lot of food for that size animal, but I saw them in the final days of their mortal coil, and they waddled happily between the old lady’s legs, pointed their beaks skyward of their own accord as the woman popped the tube in and massaged the food down toward their gizzard, a process that took about five seconds. They then waddled away briskly, quacking and flapping, to the other side of the cage. They weren’t crowded, showed no evidence of sickness, had plenty of room, and lived in clean pens, behaving not at all like puking frat boys stumbling all over each other but rather more like Beatrix Potter’s Jemima Puddle-Duck. Again most of their lives are spent in a pasture the size of a football field. A better life than the millions of Perdue chickens enjoy surely. Yves Boissiere, who raises ducks in Frespech, in southwestern France. Photos by Donna Turner Ruhlman. All this came to mind because of the news of the current bills lobbied for by Big Ag to make it illegal to try to record harmful farming practices in the United States. Which is hardly the exception in our factory-farming, cheap-meat country. If it were the exception, why would Big Ag be spending big money trying to prevent the harm from being broadcast? Jedediah Purdy wrote an articulate op-ed two days ago in the NYTimes and the paper’s editorial board seconded it. America doesn’t need more farm secrecy, it needs more farm transparency. If you don’t want someone to be allowed to film inside your building where the food our kids are eating is being slaughtered, you should be shut down until you welcome the videographer. If you want to eat meat, I believe you should be present—or, better, a participant—in the death of at least one of the animals that you eat. I took part in a chicken slaughter last summer. It was not easy, nor should it be. I cooked the chicken I killed and gutted. I took very good care to cook it perfectly. I witnessed a humane slaughter of a Mangalitsa hog the following fall and a demonstration of how it was debristled, gutted, and broken down. I’ve twice visited a slaughterhouse in Ashland, Ohio, where locally raised cows are dispatched and broken down for their muscle and bone, a federal inspector checking each one (they’re big animals and it’s pretty gruesome). I’ve written about why I believe it is ethical and yes, humane, to eat meat. I think vegetarianism is a healthy and good choice if that’s what you want and what your body wants. I believe that veganism is lunacy, and arguably inhumane (but a superb weight loss plan and, adhered to long enough, perhaps even an effective birth control strategy). But regardless what I believe, we are a meat-eating country and the Perdues, McDonalds, Smithfields, Monsantos, and Cargills are going to keep it that way, have no fear. What we and, more importantly, our legislators can do is refuse to sell out to the Big Ag lobbies for their election cash and help to make animal husbandry as humane as possible nationwide and without exception. It’s very, very hard given the billions of animals we slaughter yearly for food. But surely the first step is transparency, not secrecy, which these new bills are trying to ensure so that you can have your tasty McRib and boneless Kentucky Fried for pennies. It’s good for big business and helps your senator and representative keep that glinting smile for the camera. But it’s certainly not good for the animals we rely on for our food, which means it’s not good for your family. These are happy, healthy ducks in clean uncrowded conditions. 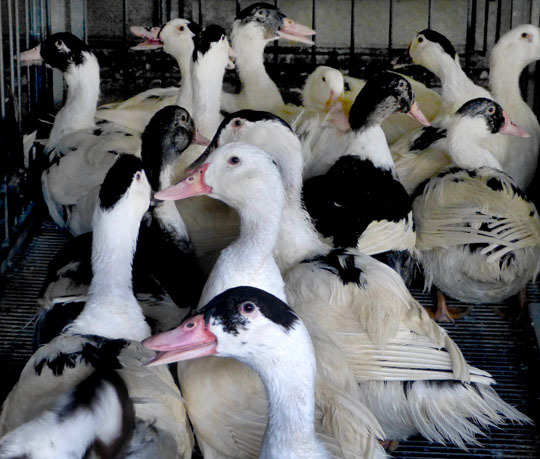 The 400,000 ducks raised for foie gras in this country enjoy the same. I wish this were true of the billions of other animals we kill for food (hello, California?!). We, worms’ meat ourselves, in Mercutio’s memorable phrase, should do better. Though now that I think about it, perhaps Congress should outlaw worms? My recent rant Cook Your Own Food. Take a look at Michael Pollan’s books and site. What’s really scary is the fact that so many don’t care and will continue to support such businesses, cameras or no cameras. Until enough people take a stand and demand better, the nonsense will continue, seen or unseen. It’s the whole “ignorance is bliss” part of the human psyche. It’s why people would rather donate money to a charity instead of taking a homeless person out for a meal and some human contact. I read on twitter this weekend that at Terrior7 in Toronto swedish chef Magnus Nilsson told the story of killing the lamb he had raised as it was grabbing the treats from his pocket and then showed an apparently horrific video of horse slaughter really bringing home the fact that we need to have a closer relationship with the things we kill to eat, not just to eat better, but to be better people. Like that you wrote on this subject, don’t ‘like’ the situations we deal with in our society pertaining to food production. When small organic farmers have to jump through so many hoops to treat their animals humanely and to not use harmful chemicals on their produce, but factory farmers can buy politicians to write legislation to hide their practices from the public…there’s not much to like. The book “Foie Gras Wars” by Mark Caro, I thought, was very insightful and a good read for anyone that cares how their food is produced. And it’s too bad that the politicians are so easily bought by the true evil-doers of our time i.e. Monsanto etc. The ironic thing about the assault on foie gras is that the people who are leading the charge to ban it in the US are the best mobilized to inform the public about the real attrocities associated with large-scale factoring farming conditions, but they are too focused on the low hanging fruit that is foie gras. Sensationalistic stories about tortured ducks in a small industry focused in, until recently, two States and now only in one were an easier campaign than trying to take on the major factory farm lobby. Couldn’t the money spent on lobbying Congress and protecting these large corporations be better utilized by these companies to develop more humane conditions that don’t “require” preemptive antibiotics for cows, for example? I say this all the time. The people trying to stop foie production are the real hypocrites. They are picking on the Foie Gras producers/farmers because they are easy pickings. Industrial AG is big business, they have deep pockets and have put a stop to any kind of protest agianst them. Remember when you asked a month ago about suggestions for the redisgned site? Wish I would have suggested less politics on the blog. I personnaly find it off-putting, even when I agree with you (as I mostly do here) — although as I mentioned last year when you asked about it, the importance of posting about these things isn’t something that we readers can judge for you. In any event, years ago, as I was trekking in the Himalayas, away from civilization for weeks, our guides brought along several goats. From time to time, the goats would be slaughtered (halal-style) and we’d eat fresh goat less than an hour later. It’s not something I’m interested in seeing again and am perfectly fine keeping that part of the food chain out of my life. There are plenty of things that I know are necessary that I don’t ned to witness personally. Slaughter is one of them. so you’re a vegetarian, yes? No, I enjoy eating meat. I just don’t enjoy watching animals being slaughtered. Of course I understand that, for me to eat meat, animals need to be slaughtered. I just don’t see any reason to think about it. Perhaps you could explain why you think that, if you eat meat, there is an obligation to watch the animal being slaughtered? As I said, there are lots of things in this world that I am glad occur, and that I benefit from in one way or another, but that I don’t see a need to experience personally. I agree with this sentiment, I don’t think witnessing animal slaughter should be a prerequisite for eating meat. It is up to the individual whether or not they want to further educate themselves in this area. I personally do like to know about the process from farm to table but that’s my choice. To say that anyone who doesn’t want to view the butchering process should be a vegetarian is a tad extreme. This detachment, this removal from the ‘nasty parts’, is a by product of modern life whether we like it or not. You can support free-range, organic and independent producers without witnessing the slaughter of animals if your conscience says it’s ok because at the end of the day you have to do what sits right with you as a person. You don’t have to be totally comfortable with slaughtering (Rulhlman himself said ‘it’s not easy, nor should it be’). But everyone who eats meat needs to be comfortable with the fact that they are eating a once-living animal. In my opinion, those who can’t handle that fact should be vegetarian. It’s the fact that Americans are so insulated from their food sources that allows these atrocities to go unnoticed. The bottom line is: If someone wasn’t doing it for you, would you do it yourself or would you become a vegetarian? If you take your car to a mechanic to have the oil changed, do you care where they dispose of the old oil? If you pay someone to weed-and-feed your lawn, would you be bothered if they refused to tell you what they were spraying on your property? Or if the law said you’re not even allowed to ask? If you took your kid in for vaccinations and they wouldn’t let you in the room while they administered the shots, would you be ok with that? You can call it politics and say you don’t want to hear about politics on a food blog, but it’s really information and knowledge. It only becomes politics when you realize that our own government is making decisions on our behalf that affect something as simple and elemental as what we eat. If we want to change it, it’s political. If laws are being bought and sold, its politics. We should know about it, even if its not pleasant. I don’t always agree with Michael on politics in general, but when it’s germane to the topic of food and food production, he’s got my ear. Off-topic stuff I can ignore or, even better, read and take in a differing viewpoint. In my youth, we seldom bought meat from grocery stores. We raised our own chickens, and someone in our family or among our friends, raised beef every year. It was long enough ago that every community had a slaughter house that we could visit. It was based partly on that experience that I decided to become a vegetarian. I passed a chicken facility recently. Not a window in the whole huge plant. That alone should be a warning. I remember the days in Montreal when our markets like Jean Talon, before it became a yuppie market, was a place we went to choose our Chicken and watched it being killed Kosher Style which is humane in nature. I freeze all chickens I buy now, including those labelled Kosher for fear of any disease…as I do fish…I don’t worry for our ducks so long as we have Chuck Hughes and McMillan and Martin Picard we will have humane raised ducks that give us foie gras. Their influence is so strong in our community as a whole city. What I would like to see in Quebec as opposed to elsewhere is how Humane a Horse is killed as to have horsemeat available here and to know is a horse raised for this or are they old horses and ex-race horses that are cut up and served. For me, a Quebec, a food lover: that is where I want transparency. Personally the argument on videos vs no videos is not as much of an argument on the concept of hiding things as much as it is on the premise of limiting unlawful entry and use of the video taken. I understand that their needs to be more transparency and people need to understand how their food is processed, but livestreaming all activities of the production process is not the answer to adding transparency to the agricultural world. I agree that cameras in facilities would help reduce a few problems because workers would then be able to be held responsible, but allowing the public to see everything that goes is not the answer. If we would allow or require this to happen in harvesting facilities then there should be cameras installed in other industries as well and who knows where the camera idea would stop. You’re right to note the complexity of the issue, thank you. Making it harder is the fact that even the humane slaughter of a pig or a cow turns many a stomach because we are so far removed from the source of our food. Great article.. I have helped on chicken day at a good friends farm It is not pretty nor easy, but at least you have respect for life and what you are eating. Its not all cello-wrapped pieces parts.. I am not religious by any means, but you can see where the concept of saying “Grace” before eating came from.. They were animals that people raised instead of nondescript nuggets of meat. When you raise your own and do slaughter it yourself you do have a different sense of saying “Grace” before a meal. From the forward to my old Signet edition of Upton Sinclair’s The Jungle. Not much has changed, eh? Related to Dan’s note above, on top of these legislative initiatives it was also disheartening to learn that American’s find it so inconvenient to eat chicken off the bone that a national chicken chain is converting to boneless breasts and drumsticks. There are many of us out there trying to help people discover where there the really great foods are. Do you have any thoughts on the right place and time to reach people (kids, adults, teens) that will best enable our voices to break through the clutter and the seemingly near-universal belief that there isn’t enough time in a day to reconsider food? Agree with your article, especially agree with the vegan comment. Good to know I’m not alone. Please keep the political articles. Food touches every aspect of our lives, and it would be myopic to think it doesn’t have repercussions outside of the kitchen or restaurant. A truly wonderful post from Michael which i (obviously) agree with 100% and am very impressed with many of the comments. So heartening to see that so many do not want to hide from the reality of where our meat comes from. Without knowledge of the process of slaughter, how can there be respect for what we consume. And do some focus on such a small part of production for foie gras and ignore the vileness of CAFOs because they lack the courage to go after the Tysons, Cargills, etc.? I think so. We always had a “no cameras allowed” policy, unless it was us doing the filming. The reason was that a lot of these people were looking for sensational effects. And they had an agenda. A competitor of ours was raked over the coals by a local reporter who was given free access to his slaughter operation. Terms like “forcibly driven to a gruesome death” still echo in my memory, along with “blood-splattered butchers”. The entire scene was depicted as a blood and guts horror story. Of course, it CAN BE a horror story. I won’t deny that there should be a special place in hell for some in the livestock-meat industry, whether they’re in a large or small operation. And if “transparency” helps get these people out of the meat/livestock business, so much the better. Michael, thank you for this article! I have to ask though are US practices for gavage and treatment of ducks the same as France? I think most European countries treat their animals better and do not use CAFO’s like we do? I personally wouldn’t want to eat foie gras here in the states just like I prefer not to eat grocery store meat as I feel we mistreat our animals terribly here. There are only a few farms perhaps now only one single farm that produces foie in this country. And they all treat the birds with great care for the simple reason that a well cared for animal is a tastier animal. This is it’s good business and good morally. Good post. I agree with those who think it’s an act of hypocrisy to avoid the nasty little subject of animal death when that death is to provide us with food. While I don’t think that we need to bath in the blood of the lamb (so to speak), I do think that anyone who eats meat has to face up to the fact that a warm, sometimes cuddly critter is made to be dead. Because of us. I strongly recommend that anyone who eats meat make the effort to track down and read “It Takes a Village to Kill a Pig”, by Jeffrey Steingarten. It can be found in the book “It Must Have Been Something I Ate” (ISBN 0-375-72712-4) Jeffrey is an honest writer, and he pulls no punches in this essay. The essay didn’t make me stop eating pork, (nor was that his intention) but it’s excruciating honesty opened my mind to what happens in a well-orchestrated and humane slaughter. Of course it really causes one to contemplate how truly horrific a factory slaughter must be. We may not actually kill animals ourselves, but we owe it to the animals we eat to be aware of how they are killed, and to make every effort to support those who practice humane slaughter. So Big Ag doesn’t believe in the first amendment, free speech? Why am I not surprised. I think everyone should take part in the gathering of food at least once in their lives. I grew up where it was a day to day experience. From killing & prepping chickens, rabbits, goats, ducks, geese, pigs and other wild animals, I had to participate in the bringing of the food to the table. Oh and for anyone interested the geese go through a hyperphagia phase in the fall so they can make it through winter. I also experienced the planting, weeding, de-bugging, harvesting, and preserving of vegetables and fruits. I have spent part of my life as a vegetarian, and the rest as an omnivore, but I honor all that give their lives so that I may eat, that includes the plants. They all must die so that we may live. I’m all for supporting small farmers and treating the animals we are going to slaughter with a little decency but, I find it hypocritical that you get all up in arms about animal rights and at the same time flood this page promoting Amazon who treats their warehouse workers like animals just so we can buy cheap stuff. I grew up in the West Indies with a grandmother who raised pigs, chickens and for me watching an animal being slaughtered for food doesn’t phase me one bit. Why? well the animal had a good life. My grandmother treated her livestock with respect. properly watered, fed and taken care of. Upon slaughter we are thankful that we have food that will last us for a while. Just about every part of that animal was used except the intestines. Two friends of mine are opening a combination butcher shop and patisserie in a town close to your heart – Durham, NC. They are featuring humanely and pasture raised meats and will not buy from any supplier that will not allow them to visit the farm. Rose’s Meat Market and Sweet Shop. I’ve seen enough videos of Joel Salatin’s operation and David Schafer’s tutorials to know that there’s hardly a family farm that would object to being on film. It’s called pride. When you hide from the lens it’s called cowardice. Recently at school, in garde manger class (remember that class Michael?? ), I finally eased up after 11 years of hard-core anti-foie gras sentiment and took a bite from a foie terrine that our chef prepared. Man, it was so delicious. I took another bite and almost cried because it was so rich and fulfilling. It was Hudson Valley foie; it was locally produced, fresh, and high quality. Need I say more, or can you fill it in? What’s up colleagues, its enormous article regarding teachingand completely defined, keep it up all the time.